Hi as I'm on my 3rd snow day in a row from work I thought I would finally get round to starting a build diary for my very first ant. 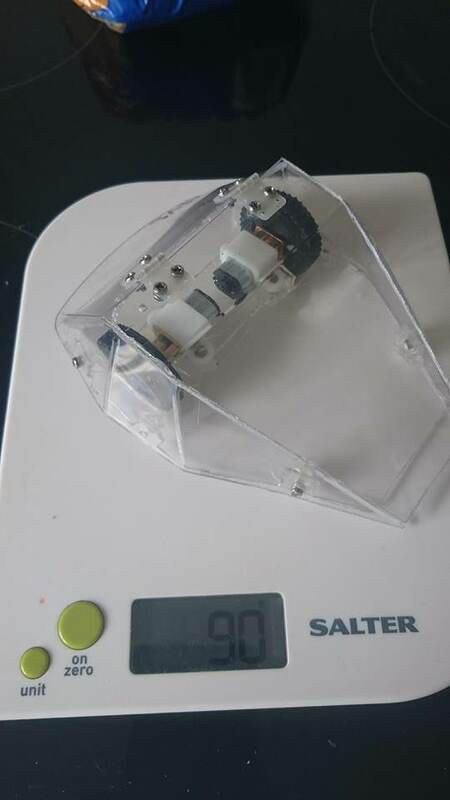 I like many other first heard about ant weights on the robot wars international special recently and it coincided with me having a desire for a new hobby were I could learn a bunch of new skills. Finding out there was a way I could build a small scale combat robot on a budget was a revelation. I've been lurking on the forums for a while now trying to gleam as much information about the process as possible. Just about every question or problem I thought of so far has been answered on here its amazing how friendly everyone is. Following on from suggestions I've seen for a first ant I decided that a flipper was the way to go so I spent a while day dreaming and doodling at work. From which I made a rough model in sketch up and then made a cardboard mock up of my idea. 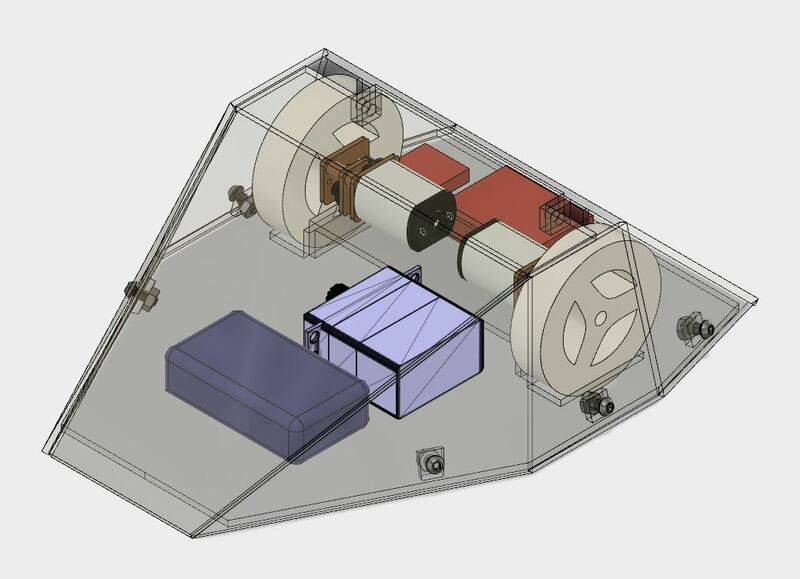 I very quickly found that while sketch up was a good starting point it lacked a way to add the detail I wanted to fully realize my idea so I moved on to fusion 360. After several hours of YouTube videos after failing to figure the program out straight away (anyone looking for tutorials a guy called Lars has some top notch beginner guides) I managed to produce the design below. Now this design is missing the arm from the servo, I decided that I would figure this out once Id actually got the components. My plan is to slowly gather that parts over the next couple of months and adjust aspects of the design as I learn more about the actual process of building it. With that in mind I decided the best place to start was with some poly-carbonate, so I could learn how it bends and the shapes I could make with it. Currently with 1.5mm Polycarb and some M2 bolts and I've managed to produce the following. 1. Whilst it fits the shape I designed the back is bowing out. 2. My tabs on the chassis at the side don't actually touch the armour. 3. I broke the tabs I had planned to make the flipper hinge with. 4. Whilst the length is good I am about 5mm to wide at one point. 1, 2, and 3 I've decided I can live with for now and continue on with the build whilst I realize this will mean I wont be able to enter this ant in anything because of being over sized I felt I was better off finishing it in case I break anything else or have any other issues so I don't waste more material than I need to. 3. 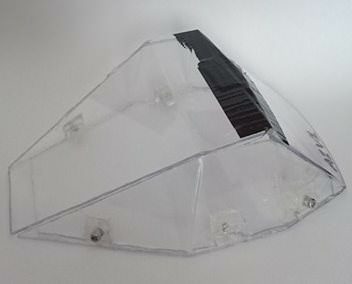 Tape is my current solution, but I have just had some tiny plastic hinges arrive that will probably be replacing the tape very soon. So as I said I'm attempting not to rush the process of building this ant. I've ordered some wheels and next on the list is my motors so I can finish making the chassis. I've also began work began work on designing a second ant which is probably going to be 3d printed. Tl:Dr Hi, new guy, building first ant. I think i remember somewhere seeing that the hinged spine of an old vhs case can be cut up for a good flipper hinge. It sounds legit to my beginner ears, those old cases were pretty tough. For the tabs you bolt the top into, can a little block of some kind be attached to chassis that could be made to fit against the lid better for you to bolt into? The tabs look quite small and fragile. If the back panel is bowing outwards is it just a little too big/wide? As I understand, polycarbonate being able to flex slightly is a very good thing, so if the back is already under strain and compressed enough that it's bowing, it might not be able to take the same kind of hit a flat panel would. Someone else will probably confirm this. Looks like a solid shape for a flipper with a big wide ramp. With a good servo I think it would be effective. I thought about using old video tape case parts but then I found these tiny hinges on eBay. The back bowing out is 100% down to the size being slightly out, being a first attempt I wasn't sure how much to allow for the folds on the template. Lesson learned for v2. The most exciting parcel I've recieved this week was the wheels for my bot. (the robot logo sticker on the parcel was a nice touch). 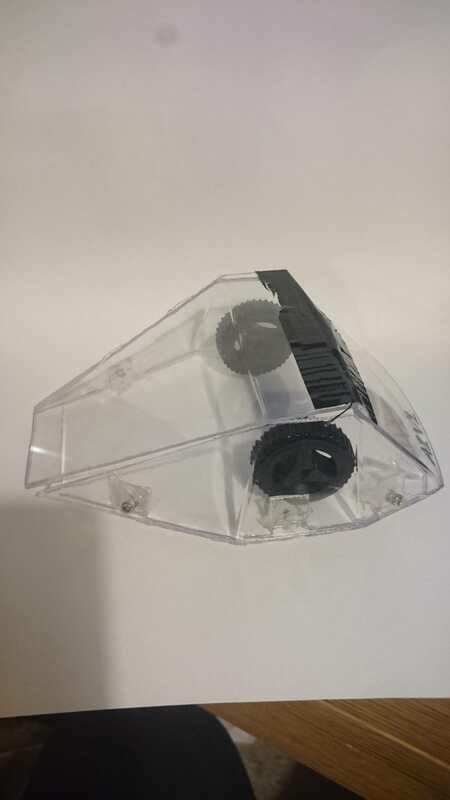 While it would be far more exciting if they were attached to motors, having my bot at least have wheels resting inside it feels like another step forward! Keep up the good work, Its looking great so far! I've now fitted the hinges, what this has taught me is my precision with cutting and drilling is terrible and needs work. Progress is slow, but progress is progress. The whole thing is very rough, my build skills don't match my design skills yet. The polycarb the motors are mounted to is only hot glued in place, but as this is only really a prototype build i think I can live with that. By my rough calculations I am on target with weight. which is nice. As an alternative to the hot glue, the basic 2 part resin glue from wilkos or places like that seems to stick to polycarbonate quite well. 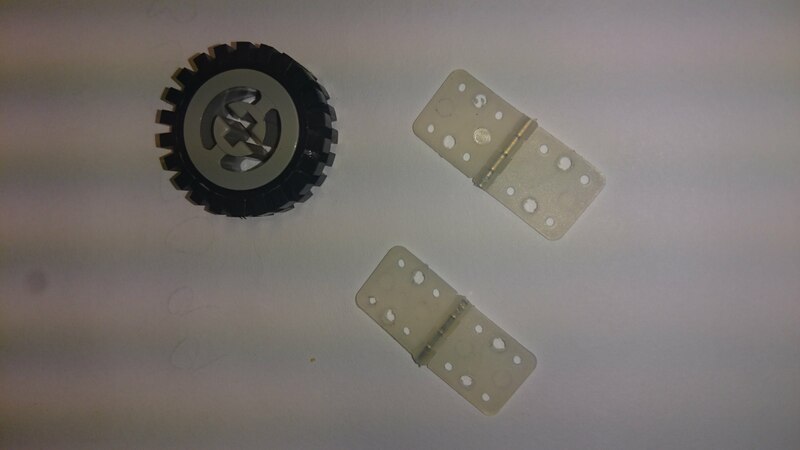 I tried sticking motor mounts to a kind of bracket with hot glue and it just wasn't strong enough, first time it fell from my coffee table (a bit higher than an arena pit but still not a huge distance) while I was test driving the mounts came off. The epoxy glue faired better and lasted through a bunch of drop offs. Little blobs of hot glue are good for fastening wires and things like a heat shrinked ESC down where you want them though. I have some epoxy I can use but I think I'll wait to the next version. I don't think this version will see combat just testing. 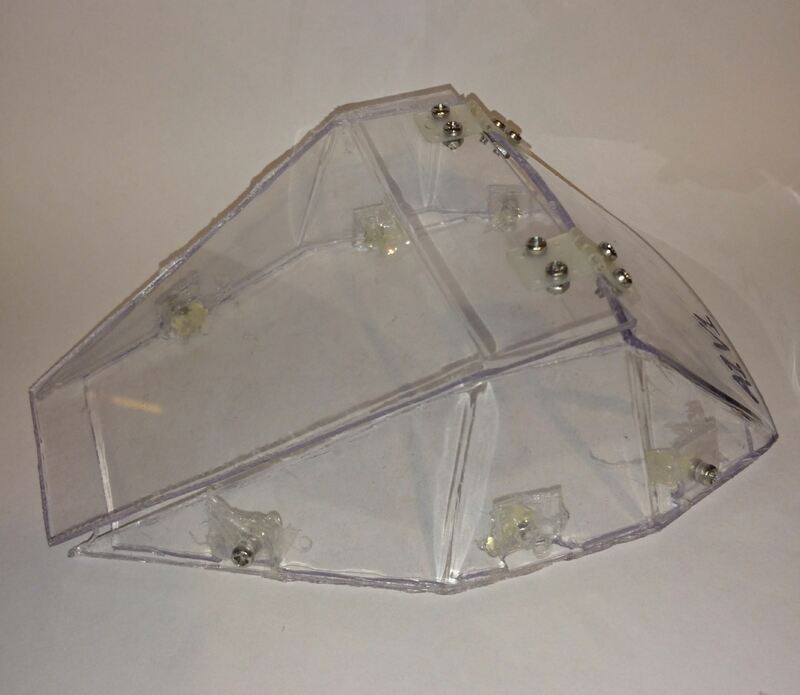 My robot Is mostly polycarb and epoxy. It's tough enough for most matches. The epoxy tends to break before the polycarb against spinners. Big complete peices come off. And glue back on. Every joint needs roughing down. Finger joints and dowelling helps a lot. I think a bit of epoxy a bit of screws would do best for polycarbonate. Leaving the other to hold on when one fails.